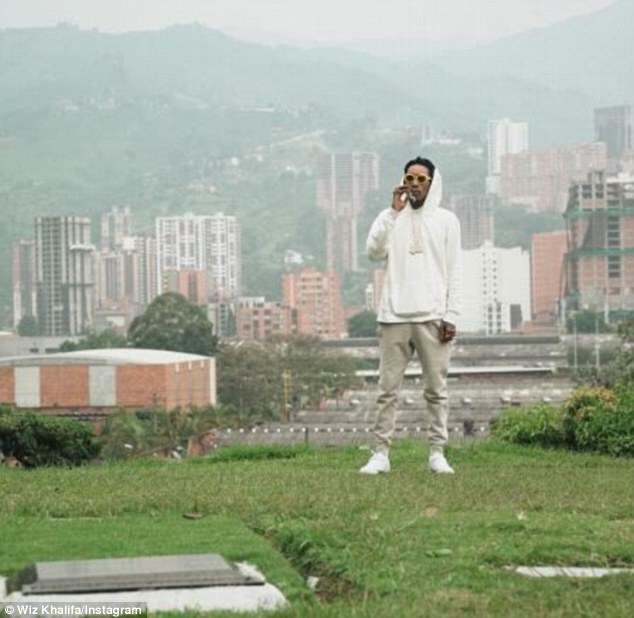 Colombians were outraged by rapper Wiz Khalifa, who posted photos of himself visiting Pablo Escobar’s grave after a concert in the drug lord’s home city of Medellin. 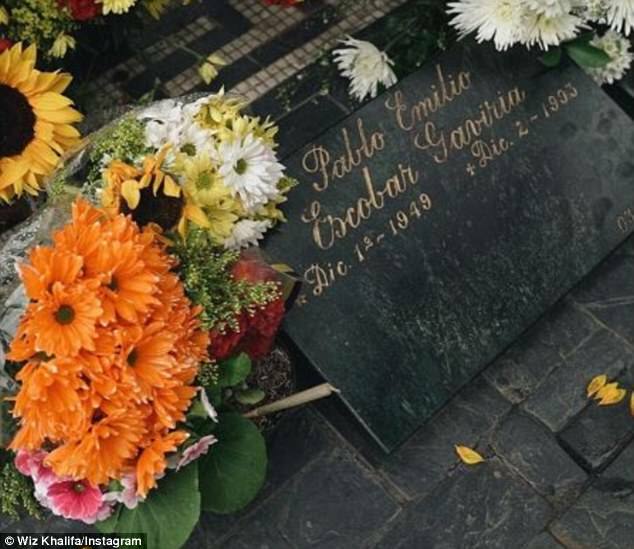 Wiz Khalifa shared photographs of himself smoking at the Cemetario Jardins Montesacro, where fresh flowers – and a joint- were left beside the drug lord’s grave . Medellin Mayor Federico Gutierrez called the rapper a ‘scoundrel’ and commenters tore him apart for his ‘disrespect’ while equating Escobar to a dictator and terrorist. Escobar, the ruthless kingpin of the Medellin Cartel who killed thousands of people, was responsible for importing 80per cent of the cocaine in America during the 1980s. Wiz Khalifa, who is known for being an avid marijuana user, posted several images of himself smoking at the cemetery in Itagüí, where Escobar is buried alongside his family. Another photograph showed a close up of Escobar’s gravestone, with a joint prominently positioned next to the fresh flowers laid at his burial site. The rapper gave a concert in Medellin on Friday, and shared the photographs on his Instagram account this weekend. Gutierrez criticized the rapper for ‘advocating crime’ and said he should have paid his respects to Escobar’s victims instead, according to the BBC. ‘It shows that this guy has never had to suffer from the violence inflicted by these drug traffickers,’ Gutierrez said. Escobar, whose cartel brought in an estimated $22 billion a year, was named the seventh richest man in the world by Forbes in 1989. While some still hail Escobar as a hero for donating money to charity and expanding social programs like housing for the poor, others still see him as a ruthless killer who terrorized his country. Escobar killed thousands of people, including politicians, judges, cops and civilians, during his reign. He is also said to have bombed an airplane in 1989, killing all 107 people aboard. 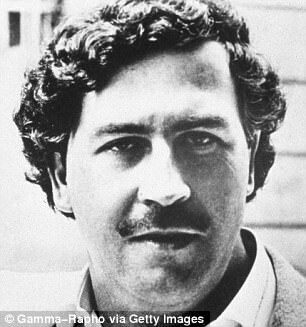 Escobar’s rise was chronicled in the ongoing Netflix show Narcos, prompting his family members to dispute the inaccuracies portrayed in the series.